Almost a month before its official debut at the Geneva Motor Show, BMW is the first details about the next generation M6. Convertible will be the first model that will be launched in June 2012. 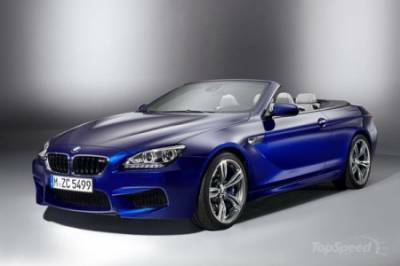 M6 Convertible will feature a more dynamic and aggressive exterior and all thanks to elements of the M-division of the company: a new grille, larger air ducts, low bumper and kit devyatnadtsatidyuymovyh drives. The interior of the car boast a specially created sports seats, leather trim and accents of carbon fiber. Folding roof requires 19 seconds to fold and 24 - to meet again. As for power, the car will be powered by eight 4.4-liter turbo engine, first used in the creation of M5. Engine power will be 560 horsepower. All this will allow him to be dispersed to "hundred" for 4.3 seconds. The maximum speed will be limited to 250 km / h.